This page describes the different scientifically-proven methods applicable for cutting to manage Oregon forests. These are time-proven forestry methods—known as “silvicultural methods”— accepted by the professional Society of American Foresters (www.safnet.org). These silvicultural methods are the range of methods suited for the many different forest types across Oregon’s geographic regions. Using appropriate terms for forestry and harvest methods helps to clearly communicate these concepts among the people, organizations and agencies that prescribe and manage Oregon forests. The use of common terminology provides a shorthand nomenclature for prescribed harvest treatments, and for how these treatments will be managed over the life of a forest. “Silviculture” is defined as the science of managing forest vegetation by controlling tree stand establishment, growth, composition, quality and structure, planned for the forest resource objectives or the landowner. A “silvicultural method” is a particular harvest treatment—either regeneration or intermediate—implemented for the purpose of achieving the long-term stand and landowner objectives. Silvicultural is a long-term process, which includes a program of different treatments/cuttings that are planned for the entire life of the stand of trees—known as the length of a rotation. A “stand” is a term describing an area of forest having a common management goal. The appropriate silvicultural method is prescribed by forestry professionals who tailor the method and timing to the specific biotic and abiotic site conditions, which aim to accomplish an array of landowner management objectives. Regeneration methods -- Goal is to begin establishment of young new stand of tree seedlings (regeneration); to by removing a mature stand at end of stand rotation length. In Oregon, the new young tree regeneration must be “free to grow” and well distributed within 6 years after the regeneration cut. 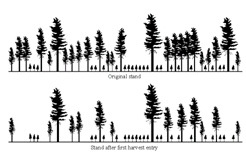 Intermediate methods -- Goal is to modify the composition, health and density of retained leave trees for continued stand development; occurs at an “intermediate” time midway during stand rotation length. This method must retain enough tree canopies to not trigger Oregon tree regeneration rules. A regeneration method is a harvest treatment or cutting procedure with the goal of a initiating new forest crop of young tree seedlings, thereby establishing and creating a new age class. The harvest treatment must open the forest canopy enough to allow young native trees to establish and grow (many Oregon tree species demand open sunlight to establish). The regeneration method is designed to remove a mature stand of trees at its planned culmination—known as the rotation length. Depending on the specific seedling establishment needs of the species and site, regeneration methods are grouped into four categories: 1) even-aged; 2) two-aged; 3) uneven-aged; and 4) coppice. Even-aged methods regenerate to establish and grow a stand with a single age class, or one tree canopy layer. Clearcutting, seed tree, and shelterwood are the three even-aged harvest methods proven to work in Oregon forest types. Many of Oregon’s native conifer and hardwood species are shade intolerant, and young trees establish and thrive under the open conditions of the even-aged management methods. “Salvage” is a generic term—that can be incorporated into any even-aged method—when that regeneration harvest includes cut and removal of dead or damaged trees from a wildfire, storm, flood, disease, or pest attack. Clearcutting method is the cutting of all (or most) trees, producing an open and fully-exposed microclimate for the establishment of a new forest crop of young trees, or a new age class. Young tree regeneration can be from planted seedlings, natural seeding, and/or pre-existing young trees. Cutting may be done in stands (over 3 acres in size), in strips, or small patches (2 acres). 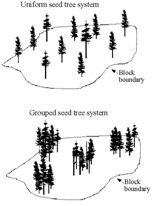 Seed tree method is the cutting of all trees, except for a small number of widely dispersed trees retained for seed production, species diversity, and/or structure. This method produces a new forest crop of young trees, or a new age class in fully exposed microenvironment. Young tree regeneration can be from planted seedlings, natural seeding, and/or pre-existing young trees. All or some of the seed trees are usually harvested & removed in a second ‘overstory removal’ treatment, after a few years when regeneration becomes established (see Shelterwood). Shelterwood method is the cutting of most trees, leaving those needed to produce sufficient shade to produce a new forest crop of young trees, or a new age class started in a moderated, partially-shaded, microenvironment. Young tree regeneration can be from planted seedlings, natural seeding, and/or pre-existing young trees. Shelterwood method can include a sequence of up to three separate cuttings: (a) an optional preparatory cut to enhance conditions for seed production; (b) a shelterwood (establishment) cut to initiate regeneration; and (c) an overstory removal cut to release the young regeneration from competition with the overstory canopy. Shelterwood offers options for the pattern of openings and shelter canopy created, including: uniform shelterwood; group shelterwood; or irregular shelterwood (uneven pattern; residual trees may be left a longer time, added non-timber objectives). Two-aged methods regenerate to establish and grow a stand with two age classes, or two tree canopy layers. The resulting stand may be two-aged or tend towards an uneven-aged condition. These methods apply the same primary cutting techniques as do the even-aged methods, except that the retention of a number of extra overstory green trees left indefinitely for strategic purposes, such as structure, habitat, shelter, aesthetics, and/or public policy. The consequence of this extra retention is slower regeneration establishment and retaining a second age class of additional overstory. “Salvage” is a generic term—that can be incorporated into any two-aged method—when that regeneration harvest includes cut and removal of dead or damaged trees from a wildfire, storm, flood, disease, or pest attack. Clearcutting with Reserves – A clearcut, in which varying numbers of canopy reserve trees are not harvested to attain goals other than regeneration. Seed Tree with Reserves – A seed tree cut, in which some or all of the seed trees are retained after regeneration has become established to attain goals other than regeneration. Shelterwood with Reserves – A shelterwood cut, in which some or all of the shelter trees are retained after regeneration has become established to attain goals other than regeneration. Uneven-aged methods regenerate to establish and grow a multi-aged stand, or three or more tree canopy layers. These methods harvest and remove some trees in most size classes either singly, in small groups, or in strips. Long-term management under this method demands more frequent return harvest intervals, which are necessary to periodically establish small amounts of new age classes and remove small numbers of trees from other age classes. Many of Oregon’s native conifer and hardwood species are shade intolerant and are not very conducive to management under uneven-aged methods. “Salvage” is a generic term—that can be incorporated into any uneven-aged method—when that regeneration harvest includes cut and removal of dead or damaged trees from a wildfire, storm, flood, disease, or pest attack. Method is also known as “all-aged,” because it maintains a mixture of three or more distinct, well-represented age classes. The group selection method removes trees and establishment of a new forest crop of young trees, or a new age class occurs in small “groups”—measuring usually a half to 1.5 acres in size. The width of group openings is approximately twice the mature tree height, depending on the microenvironment suitable regeneration. The management unit or stand in which regeneration, growth, and yield are regulated consists of an aggregation of many groups (19 in example shown). Young tree regeneration can be from planted seedlings, natural seeding, and/or pre-existing young trees. This uneven-aged method relies upon gentle topography and an intricate planned network of logging skid trails to access each group, while also protecting other groups not to be harvested at that time. Group ‘selection with reserves’ would retain a few trees within the harvested group opening; the retained trees are not cut to attain goals other than regeneration within that group. The single tree selection method removes individual trees of all size classes, in a pattern more or less uniformly throughout the stand. The single trees removed fosters establishment of a just a few new young trees, and promotes growth of remaining trees. Young tree regeneration can be from planted seedlings and/or natural seeding. This uneven-aged method relies upon gentle topography and an intricate planned network of logging skid trails to periodically access the entire stand area (frequent intervals), during each harvest of a few trees, while also protecting the majority of trees not to be harvested at that time. Coppice methods achieve the majority of regeneration from stump sprouts or root suckers, to generally establish and grow a stand with a single age class, or possibly two tree canopy layers and two age classes. Oregon’s native conifer species cannot reproduce successfully by sprouts or suckers; and neither do commercial hardwood species. Coppice method is limited to quaking aspen management in eastern Oregon. Coppice – All trees in the tree canopy are cut; and the majority of young tree regeneration is from sprouts or root suckers. Coppice with Reserves – Several reserve trees are retained in the tree canopy to attain goals other than regeneration. The method may create a two-aged stand. Coppice Selection – Only selected canopy trees of merchantable size are cut at each harvest, resulting in an two-aged or uneven-aged stand. An intermediate method—generically called “thinning”— is a harvest treatment with the goal to modify the existing stand of trees, allowing for continued stand development—usually intended to enhance the health, composition, quality, density, and/or growth of the established leave trees. Intermediate methods cut trees (usually merchantable) many years or decades prior to the final regeneration harvest. This method occurs at some “intermediate” time midway during the planned entire life of the tree stand—known as the rotation length. Intermediate cuttings are a stand-tending phase of a silvicultural method. They are different from regeneration methods, which are designed to remove a mature stand, and begin establishment of young new stand of seedlings. The most common term applied to intermediate methods is “thinning,” because to the lay-person when some trees are removed and many other trees are retained from the same area, the forest stand appears to be thinned. 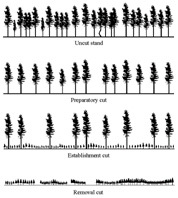 A “pre-commercial thinning” is conducted in a sapling-size or pole-size stand of trees, from which the size, volume and value of trees cut is too small to justify harvest and removal of merchantable logs to mills. A “commercial thinning” is conducted in a pole-size or larger immature stand of trees, from which the size, volume and value of trees cut is large enough to justify harvest and removal of merchantable logs to mills. Salvage – Removal of dead or damaged trees after a destructive wildfire, storm, flood, disease, or pest attack.